We are excited to invite Hannah Muller of Full Belly Farms back for another amazing wreath workshop! Hosted in our amazing "Flower Factory" at the Farm at Park Winters, this dreamy event is not to be missed. Hannah will demonstrate the techniques of preserving and drying your own flowers, and teach you how to create amazing dried floral wreaths. These wreaths will keep their vibrant color, and wonderful scent for years to come. We will have warm beverages and refreshments to add to the cozy experience. Tickets for this event are $145/person. This includes organic flowers from Full Belly Farm, and refreshments. Hannah Muller is a farmer and florist in the Sacramento region. She was born and raised on Full Belly Farm, which is located in the beautiful Capay Valley in Yolo County. Full Belly Farm grows over 400 acres of Certified Organic fruits, vegetables and flowers. Of those 400 acres, they grow 15 acres of flowers, which they sell primarily through their farmers markets, to wholesale buyers and local stores and restaurants. After completing her studies at the University of Oregon, Hannah returned to her family’s farm and began Full Belly Floral, a floral service that sources and arranges locally grown flowers for weddings and events. She creates arrangements that mimic the surrounding landscape, and utilizes the fresh fruits, vegetables and flowers grown on Full Belly Farm to create unique and wild “garden style” arrangements. 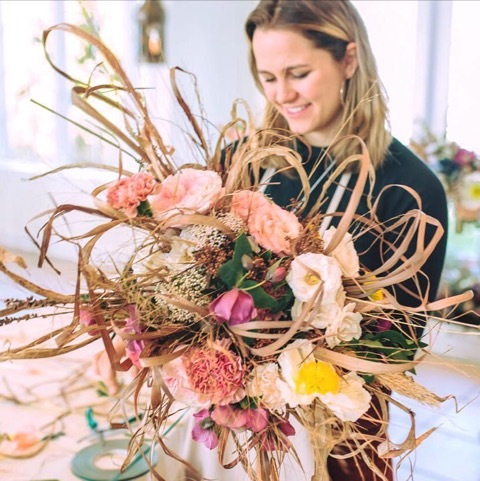 Hannah designs for over 50 local weddings and events a year and is helping to pioneer the field-to-vase movement in Northern California. She hopes to draw attention to the importance of not only eating locally grown produce, but supporting local flower growers as well.